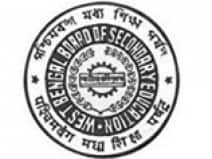 In West Bengal, WBBSE and WBCHSE conducts class 10 and class 12 examination respectivley. WBBSE Class 10 exam will commence in the month of March. WBCHSE Class 12 exam will commence in March 2018 and conclude in April 2018. After the exam WBBSE and WBCHSE will declare the result in the month of May. Last year WBBSE 10th result was declared on 6 June, 2018. The pass percentage was 85.49%. Sanjivani Debnath of Suniti Academy in the north Bengal district of Cooch Behar got Ist rank scoring 689 out of 700 (or 98.4%). WBCHSE Class 12 pass percentage was 83.75%. Granthan Sengupta of Jalpaiguri District School, from the arts stream, topped with 99.2%. Students can check the results of the 10th, 12th Board Examination 2019 on www.livehindustan.com. Apart from this, the results can be checked on the official website of the Board.